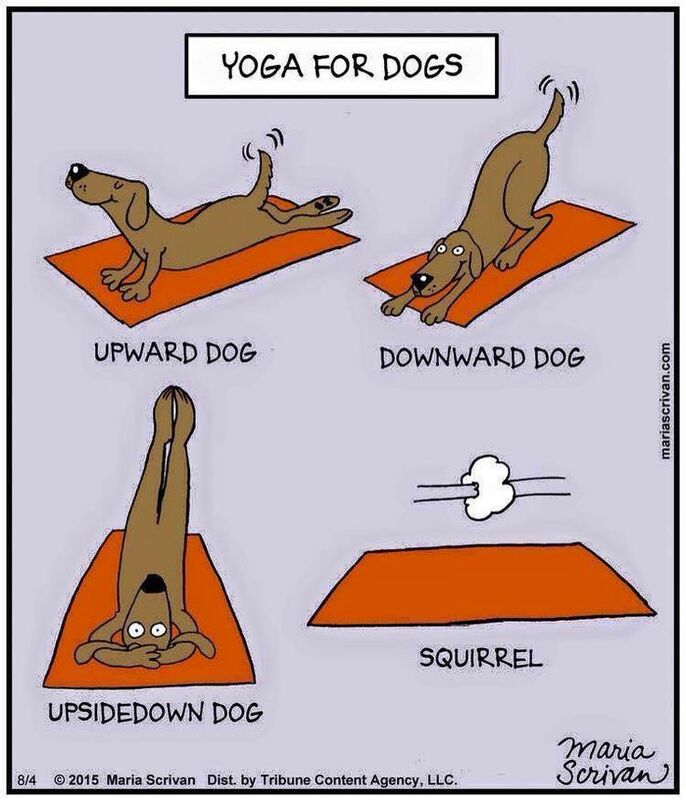 Nothing like doing yoga and then seeing your dog effortlessly do it better! 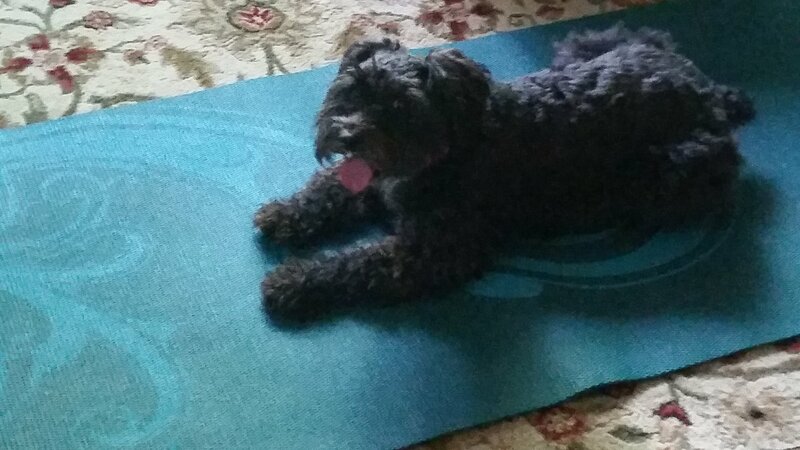 If I catch Daisy doing it on my mat, I’ll snap a pic. Usually she just likes to lay there to block me. Week one of my challenge is done! And it went pretty well. I had planned on 5 times, and I did….although, I did have to get up Sunday after dinner to do the 10 minute routine since I had forgotten. Maybe I should add this to the challenge?? My ladies at work and some others thought it would be fun to do a Yoga Challenge in April. Certainly not as difficult as the Burpee Challenge we did last month, but much more relaxing. Some of us just don’t do yoga as much as we would like, some of us hate stretching, some of us have never tried. Whatever the reason, this will be an excellent way to both stretch and start a consistent yoga practice. We are all going to do the same routine, but will vary the poses depending on our experience and flexibility. I invite you all to play along with us. The idea is to decide how many times a week we can do it, and how long we will hold each pose for, increasing that time each week. I am going to do the practice 5 times a week, and hold each pose for 3 breaths to start, adding a breath each week so I will be holding poses for 6 breaths on the last week. It’s our challenge, so we can decide individually how we want to run it. But once we decide, the challenge is to DO IT consistently for the month. this is meant to be a stretching routine. Do not try if you have any medical reason not to, and do not push any of the stretches beyond comfort level. The best way to measure the time of the pose is with breathing. Breathing is important in yoga, deep full breaths are far more meaningful than actually touching your toes. Counting your breath is also easier than keeping an eye on the clock, and lets you focus on the movements. Additionally, it makes sure you are not holding your breath! 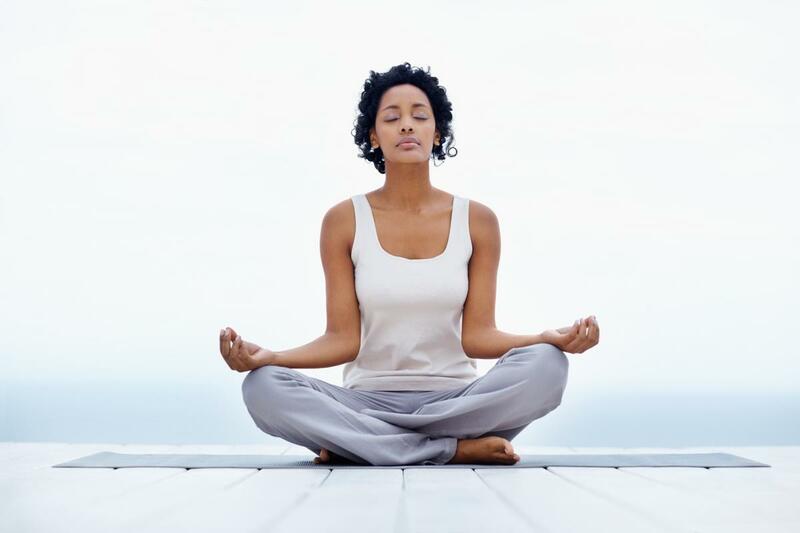 Traditionally, you should inhale as you start the pose and exhale as you deepen it. So inhale as you start, exhale as you settle in it and then try to take a deep, full breath (in and out) as you hold it. 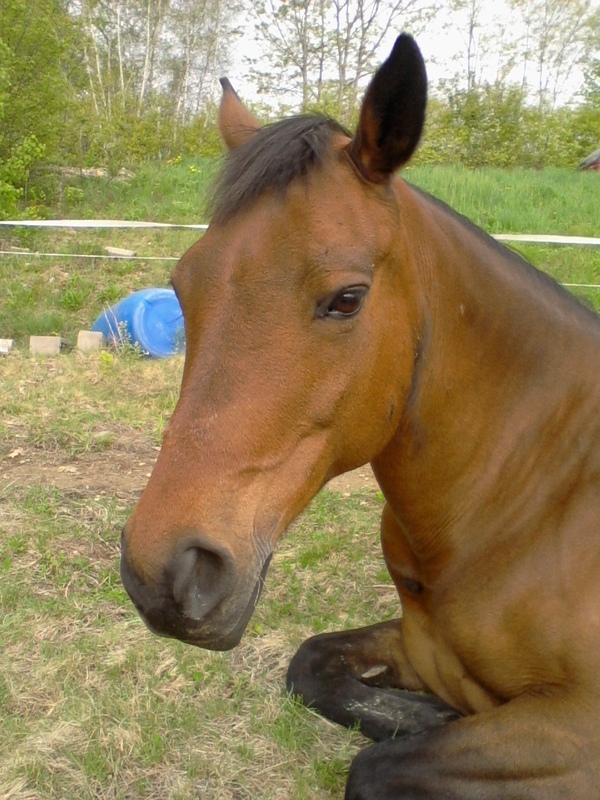 That would be holding the pose for one breath. The following week, try to add a full breath, and another the following week, increasing the duration of each pose. Slower is good, taking the air and holding it for a beat before releasing it instead of sucking in and immediately chuffing it back out. The routine takes roughly 10 minutes. If you are starting with 1 breath, it might just take 8 minutes, by the time I get to 6 breaths it will probably top 15 minutes. PS: these pictures are of people who clearly have been doing it forever. As long as you are reaching and breathing, whether you touch your toes or the floor is really immaterial. The practice matters, not the end result. stand with feet together, and palms touching in front of your chest, then sweep arms wide out to side and overhead, touching palms as you stretch up. Inhale as you go up, exhale on way down. These are continuous, flowing movements (as is the Forward Bend, next) so they don’t need to be held for a count of breath. Do 4 sweeps overhead before starting Forward Bends. start in Mountain Pose. 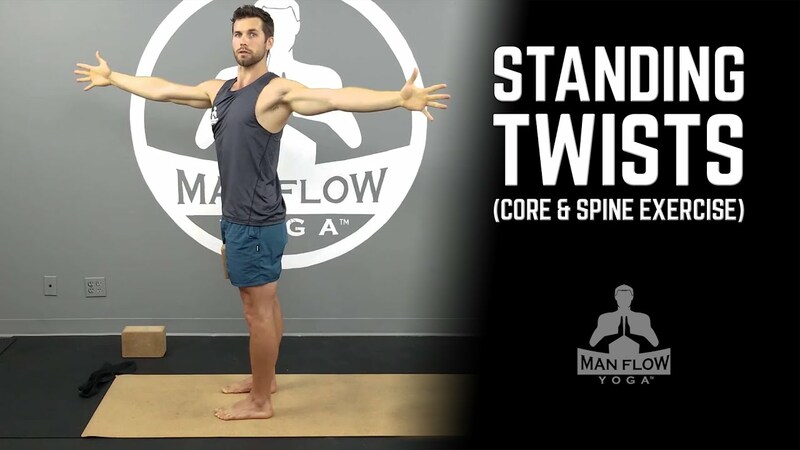 Sweep arms up, then out again as you fold forward from the hips (folding from the hips is important, bending your back at the waist can hurt your back and won’t stretch the back of your legs as well). Reach hands as far towards the floor as you can, then sweep arms up and return to Mountain Pose. Repeat 4 times. 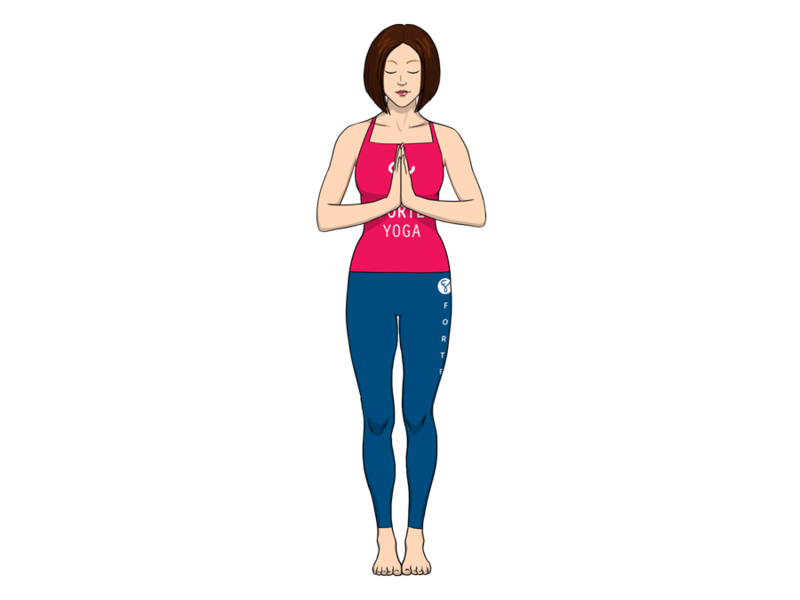 from Mountain Pose, clasp hands behind back, roll shoulders back (inhale) and bend forward (exhale), raising arms as high as possible above your back as you bend. Release arms and sweep forward as you straighten. Do 4 times. raise arms half way out to side, drop the shoulder blades down your back (in other words, don’t hunch your shoulders, they should be down and relaxed), inhale and twist to face one side. Try to keep hips straight (ish) and use your middle to twist, not legs. 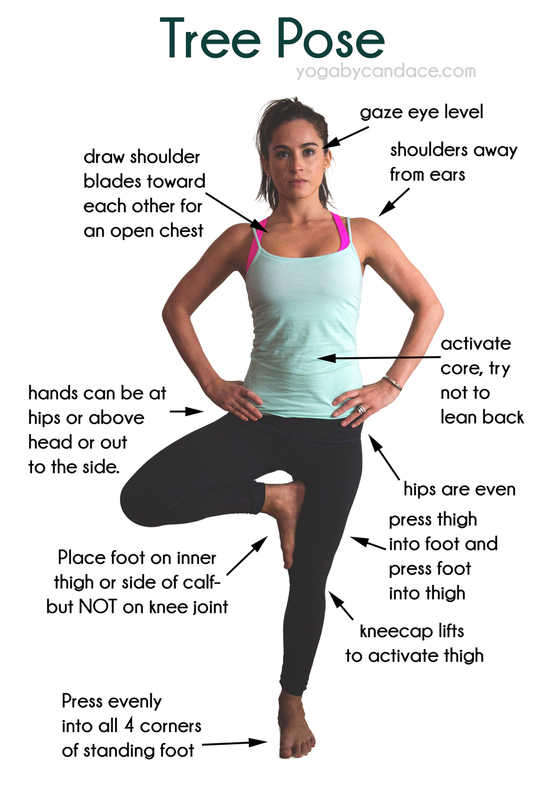 Start in Mountain Pose, then stand on one leg, foot secure on floor, weight in the heel. Tuck your other heel against your leg, with toe on floor or along your leg. Sweep hands out to sides and above your head, touching your palms. Stretch up as you balance and hold for your number of breaths before changing sides. this can be done on knees or toes, your choice. From hands and knees, raise to a push up position for your number of breaths. Keep thighs tight, core tucked in, shoulder blades together, and back straight. from Cat, push back so arms are outstretched, forehead is on floor and your seat is on your feet (or as close as you can get). sit with legs, straight out and back upright. Tighten thighs, flex feet and use core to keep upright, place hands lightly behind for balance. lean forward from hips, not waist, stretching hands toward toes (keep toes flexed if possible). leaving one leg extended, cross your other leg over, placing foot on outside of knee. Hook opposite arm over the knee and place other hand on floor behind hip, twist so that you are looking over the shoulder of the hand on the floor. Try to keep spine straight vertically as you twist. wiggle a bit til your sitting bones are on the floor comfortably, with ankles crossed and hands on knees, back straight. Stretch arms out to side, palms up. Take a deep breath, and enjoy the time and love you just spent on yourself. 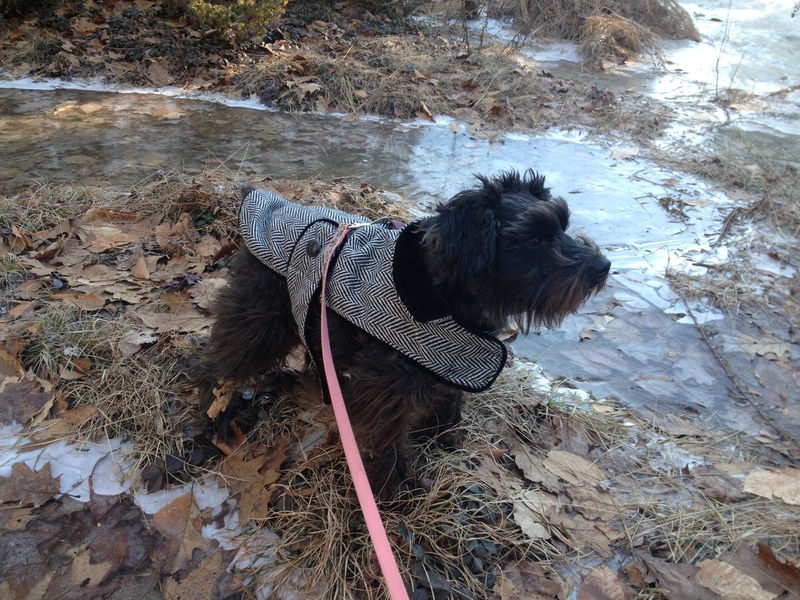 And on the third day of Spring…. I know I have done a couple runs, but they were generally to get somewhere. Today I ran just to have a nice long run out on the road. I am proud I did because it was spontaneous and the weather was not promising. Blue sky and sun always invites us out to play. It is harder to motivate yourself to get out the door (instead of downstairs on the treadmill where you can watch tv) when there are looming gray rain clouds out there. I thought it would be raining when I got up, and when I realized that it was light out and still dry, I thought I should actually run outside. I ran my personal 5k route (it is actually a hair over, 3.3 miles, so a good trainer) and made it up all the hills (there are nine of varying size). I am betting it was the stairs I did throughout the winter on my walk breaks at work. My time wasn’t all that great, but with hills and first run of the season, I can live with it. I almost beat the weather. I had just hit the 2 mile mark when I saw the first floating snowflake. At least it wasn’t rain! Within half a mile it was a steady snow/sleet mix hitting me in the face. But it was still a wonderful run, and being outside was fantastic. And now on to the rest of spring (sans snow). When I was doing my research into Burpees, I found that they were used in the 40s as an entrance test into our military. If you could only do 27 in one minute, you were considered in poor shape. Excellent shape was being able to do up to 48 in the given minute. You know I had to try that after my month, right? Apparently, I am in poor shape! I could only squeak out 26 in the minute. Of course, I suppose I shouldn’t have tried it after running 3.6 miles. But I felt fine–just slow, apparently. I guess I will just have to keep trying!